Camping in a recreational vehicle can be a great way to see the country. You get to experience the great outdoors at campsites in some of the most beautiful areas at a comfort level you just can't get with tent camping. And while you'll pay more to travel in an RV than you would to camp in a tent, there are ways to pare costs down. The biggest expense with RV camping is the vehicle itself. Buying an RV isn't cheap, yet there are numerous ways to save on the purchase. For starters, you'll spend less if you purchase a smaller travel trailer or fifth wheel than if you splurge for a larger trailer that sleeps nine or 10. And if you're willing to buy used, you'll score considerable savings there, too. Just like cars, brand new RVs depreciate at a rapid pace. Of course, you could always just rent an RV when you need one. Through a website like GoRVing.com, you can search for and compare prices for RV rentals of all sizes, many of which cost less than $1,000 per week. According to Kevin Broom, spokesman for GoRVing.com, there are additional costs to consider on top of renting or owning an RV. For starters, you'll need to pay for fuel. You'll also need to pay for "amenity kits" that include pots and pans or bedding, unless you want to bring your own. On top of those expenses, you'll need to pay for food and entertainment, just like you would with any trip. From there, where you take your RV can play a huge role in how much you'll pay. "You can choose to stay in different types of campgrounds — ranging from rustic to luxurious," says Broom. If you want to save money, you may need to think outside the box. Why? Because campgrounds with more amenities tend to cost more. It pays to look beyond the highly advertised campgrounds to some alternative options. Here are some of the most affordable places to camp. Although options vary dramatically from state to state, state parks offer one of the most affordable ways to camp. Many states offer their own websites or online portals that make researching and reserving camp space easy. 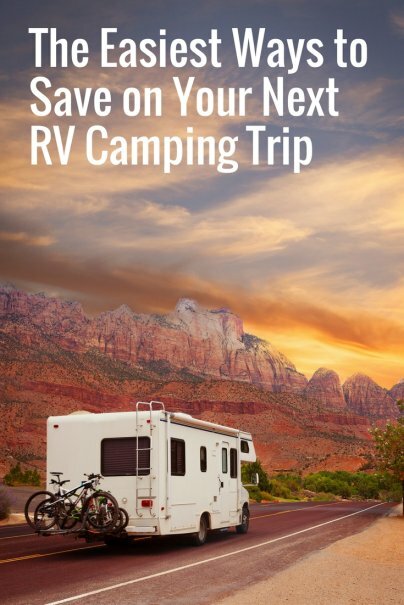 You can also use a website like Reserve America to look for inexpensive state camping resources in your area. You'll pay more or less for your campsite depending on the amenities you select. If you want to bring your RV to a "primitive" camping site without electricity and water, you'll pay a lot less. Sites that feature a "full hookup," on the other hand, tend to cost more. Still, state parks can make camping affordable. At Brown County State Park in Indiana, for example, you can get a full hookup campsite for just $23 per night during summer. At state parks in Colorado, full hookup sites start at just $28 per night. And at Florida's Big Lagoon State Park, nightly rates for an electric campsite start at just $20. Explore state park options in your area to find the best deal. National parks offer another smart option for campers and RV enthusiasts looking to save. While national parks don't necessarily have the amenities of luxury campgrounds, they do offer a closeness to nature that is harder to find elsewhere. And, depending on the national park, camping costs can be downright cheap. The downside to bringing an RV to a national park is that sites with full hookups are rarely available. The U.S. National Park Service website makes it easy to compare costs for camping on federal lands. Use the "find a campground" tool to search for national parks with camping space in your area or anywhere you want to take your RV. At glorious Glacier National Park, for example, you can book nonelectric and electric camping sites for as little as $20 per night. At Crater Lake National Park in Oregon, you can book a no-hookup site for just $31 per night. Another way to save money when traveling in an RV is to look for smaller, "no frills" campgrounds. There are plenty of options all around the country, but you'll need to search and compare prices to find the right one. Prices for the more affordable Journey campgrounds vary dramatically based on location and amenities. You can book a week at the Grand Canyon/Williams Campground in Arizona with full hookups for $411 per week in September, for example. Or, stay in a lower demand area such as Sioux Falls, South Dakota, where you can book a whole week with full hookups for $372. According to Broom, the best step for families seeking cheap camping is to shop around and compare lots of different options. While you search, also remember the golden rule of camping: The more amenities or "perks" a campground has, the higher the nightly rates. And, if you're facing sticker shock, keep in mind that RV camping is just a lot more expensive than tent camping in general. Not only do you need a larger site when you have an RV, but you'll always pay more to hook up to electricity and water. The larger your RV, the more these charges typically cost. At the end of the day, RV camping can be as cheap or as expensive as you make it. The best way to keep costs under control is to choose your RV wisely, pick your camping stops carefully, and plan ahead.